If you’ve ever spent some time in our Tasting Room; chances are you have encountered three things that left a lasting impression on you. Firstly, the view over the Hemel-en-Aarde Valley (with a spot of ocean in the distance) from the deck, secondly, our beautiful wines, and thirdly, the smiling faces of our fantastic tasting room assistants. Should you stroll in through the glass doors and over the bridge, past the stainless steel tanks, you’ll be met by one of these assistants. And in line with our focus on hospitality and wanting to make you feel instantly “at home”, we thought we’d introduce you to the team before you arrive. That way, it will feel like you are meeting up with old friends! Captain, Petula Domingo (far right), runs a tight ship. Officially she’s known as the Tasting Room Manager who cracks the whip when necessary, but unofficially she is also a mentor, team praise singer and armchair psychologist. 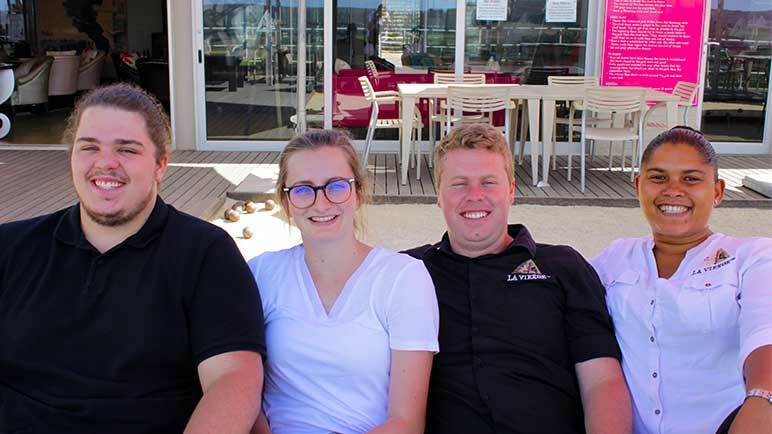 Nothing gets her down and she’s always encouraging her colleagues to make sure visitors to La Vierge have an experience they’ll remember fondly for years to come. “Visitors can expect friendly staff, a relaxed, comfortable atmosphere and fantastic wine!” Petula says while gazing across the valley. She has lived in Hermanus for more than ten years and fell in love with viticulture many years ago when she was working at a different wine estate. Since those days she’s sharpened her vino-knowledge with extracurricular studies from the Cape Wine Academy and now she selflessly shares her experience with the other tasting room assistants. Pairs it with: Nothing but sea views from her patio! Second in command is semi-professional Elvis-impersonator, Ryno Paxton (second from right). 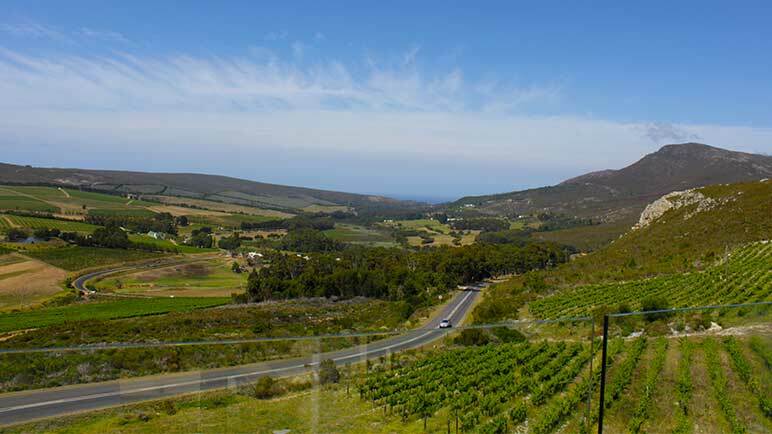 He also fell in love with wine while working for another wine estate in Stellenbosch, but when the opportunity to work at La Vierge presented itself, he jumped at the chance to call the picturesque town of Hermanus “home”. Also in his past is extensive experience working for well-known cruise liner company, MSC as part of their entertainment team. (Ryno claims this is where he picked up the Elvis impersonating, but we think he had been practising in the mirror long before then!) He is a self-proclaimed Sauvignon Blanc drinker, but lists La Vierge’s Nymphomane as his other favourite, because he says “it’s four of the best wines you could ever have, together in one glass”. That, combined with the humour of the La Vierge brand (and the amazing view from the bathroom!) is why he thinks every visitor to the Valley simply has to visit La Vierge. New addition to the dream team is professional wine-enjoyer Victor Perkins (far left). A regular visitor to La Vierge long before a spot on the team opened up, Victor is familiar with the wine and he and Petula have had countless discussions about which flavours and characteristics each possesses. In fact, the first thing Victor will tell you about his time in the tasting room is “I feel like I’m home… Like I’m visiting extended family!” And that is exactly how he approaches visitors to the Tasting Room too – with the warmth and familiarity of family. He recalls hanging out on the patio with a group of friends. “Whichever wine the group enjoyed the most while doing a tasting, we would buy for our braai that evening”, Victor reminisces. We are ready to receive you! 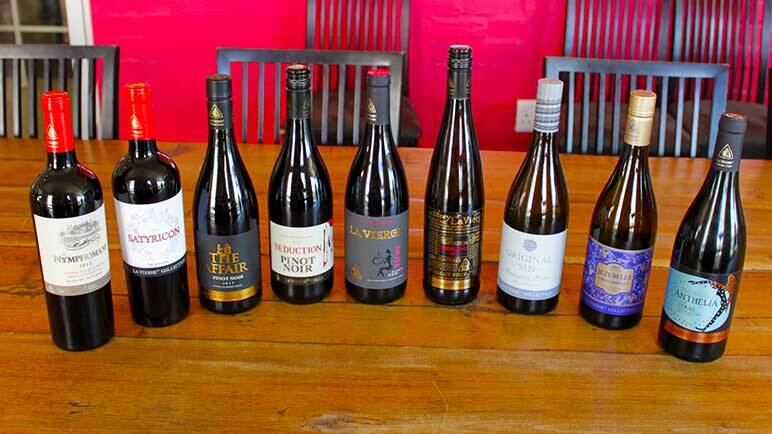 Our delicious range of white wines is being chilled and the red ones are being cracked open as we speak. 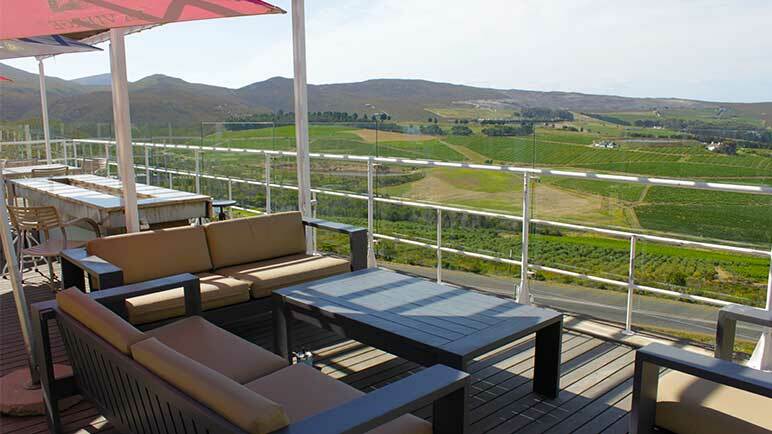 Simply visit our website to get in touch with us or for directions to our Tasting Room. And should you wish to have your wines delivered to your doorstep rather than taking them home in your suitcase, you can always purchase them from the La Vierge online shop. No reason to miss out on an unforgettable wine-tasting experience with us this festive season. We look forward to welcoming you in our little corner of paradise!